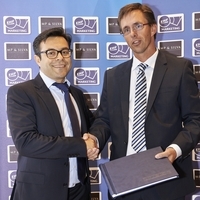 EHF Marketing GmbH has signed a long-term deal with leading sports rights company MP & Silva. EHF Marketing GmbH, the marketing arm of the European Handball Federation, has signed a long-term deal with leading sports rights company, MP & Silva, to market the media rights for Europe’s top club handball competitions. The seven year contract includes the sale of media rights on all platforms worldwide for the VELUX EHF Champions League, Women’s EHF Champions League and Men’s EHF Cup as well as the finals of other club competitions including the Women’s EHF Cup, Women’s Cup Winners’ Cup and Men’s and Women’s Challenge Cup. The deal also includes the worldwide streaming rights for betting companies. MP & Silva and EHF Marketing GmbH have been working successfully together for a number of years, with the company already responsible for the distribution of media rights for the VELUX EHF Champions League and the Women’s EHF Champions League in territories including the Middle East, France, USA and Canada. The sale of media rights for the EHF’s club competitions has previously been handled in‐house by EHF Marketing. EHF President, Jean Brihault, said: “The EHF’s club competitions have made tremendous progress over the last few years, setting new standards on the international sports market through events such as the VELUX EHF FINAL4 and attracting an ever-growing television audience. The partnership between EHF Marketing and MP & Silva is a further positive step in the successful development of these competitions." The contract between EHF Marketing and MP & Silva was signed between Andrea Radrizzani, Group CEO, MP & Silva and Peter Vargo, Managing Director, EHF Marketing GmbH at the headquarters of the European Handball Federation in Vienna, Austria (pictured). MP & Silva is a leading international media rights company that owns, manages and distributes television media rights. With an annual turnover of USD 350 million, the MP & Silva group has established an exemplary track record in distributing TV and media rights for sports federations, leagues, clubs and rights holders and represents some of the most important and world‐class sports events. The company’s unparalleled television rights portfolio ‐ providing annually over 10,000 hours of programming to over 200 broadcasters in 215 countries ‐ includes Europe's top leagues in football, FIFA World Cup qualifiers, Grand Slam tennis, motor racing, handball, baseball, volleyball, boxing and many others including the Asian Games. Headquartered in London and Singapore, MP & Silva operates worldwide through regional offices in Beijing, Budapest, Dubai, Dublin, Hanoi, Paris, Miami, Milan, Monaco, Munich, New York, Tokyo and Warsaw. Preview picture: Group CEO, MP & Silva Andrea Radrizzani and Managing Director of EHF Marketing GmbH, Peter Vargo. Text picture: EHF General Secretary Michael Wiederer, Andrea Radrizzani and Peter Vargo.